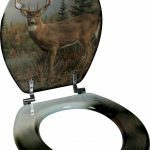 Deer Toilet Seat. Round MDF seat 15.5in x 13.5in fits standard toilets. Features art on both the seat and lids.